Show your cataract patients the difference they can expect following their IOL implantation. 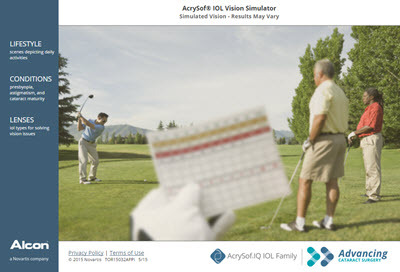 AcrySof® IOL Vision Simulators are web-based applications that demonstrate simulated visual outcomes with various AcrySof® IQ lens options. Access the AcrySof® IOL Vision Simulator here. Access the AcrySof® Toric IOL Vision Simulator here. On your desktop, right click. Click Next and enter a name for your shortcut. AcrySof® IOL Vision Simulators have been optimized to run on most modern browsers, including Internet Explorer* 8 and above, Firefox,* Chrome* and Safari. * They will not run on iOS* or Android* tablets or cell phones.